Commuters who travel by train from Mid Sussex to London face a nine-day shutdown of services from Saturday (February 16). The closure, which has been timed to coincide with February half term, means no direct rail services will run between Brighton or Lewes and Three Bridges between February 16 and February 24. Rail replacement buses will be in operation, but journey times are expected to take an hour longer than usual. The closure affects services to and from Hassocks, Burgess Gill, Wivelsfield, Haywards Health and Balcombe. The closures are part of a £67 million upgrade of the Brighton Mainline. Network Rail said the work will renew and upgrade track junctions and signalling, shore up embankments to reduce the risk of landslides and introduce new technology that not only detects potential problems before they occur, but can help the railway recover faster if there is a fault. There is also extensive work within four Victorian tunnels to stop leaks and drainage issues, which have caused significant delays for passengers in the past. John Halsall, managing director, Network Rail South East route, said: “This work is absolutely critical as this stretch is one of the most unreliable parts of the network, accounting for half the delays to trains arriving from the south into central London. “We know it’s never a good time to close the railway, but the only alternative would have been to close the line for 84 weekends over the course of two years. “Doing the work over this nine-day period means we can achieve so much more and deliver the punctuality and reliability benefits to passengers much sooner, plus the railway is much quieter during the school holidays. Rail operator Govia Thameslink Railway (GTR) said it is diverting what services it can and is laying on a rail replacement bus service. 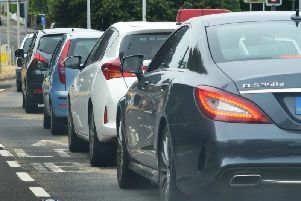 It added that Three Bridges station car park will be turned into a 'bespoke bus hub', with toilets, a customer information point, refreshments and extra staff on hand to help passengers. Keith Jipps, GTR’s infrastructure director, said: “While we are putting on over 200 rail replacement buses and bringing in hundreds of additional staff, I’d urge passengers to consider alternative routes, working from home if possible or travelling outside the rush hours. It will take much longer to make your journey with travel times extended by as much as one hour. “The train via Littlehampton is the best alternative to and from Brighton and for other journeys we’ll have buses and coaches in circulation every day on nine core routes, many of them connecting with a dedicated bus hub at Three Bridges.